With a full moon shining above, only the brave dinos climb aboard the night train. Buddy, Mr. Pteranodon and Tiny ready themselves for a spooky scavenger hunt adventure lead by the conductor, a Troodon dinosaur. 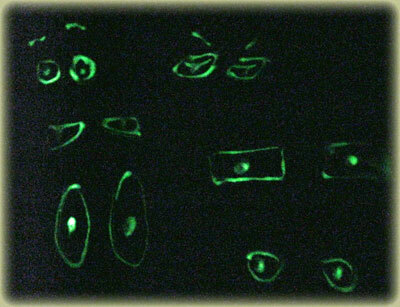 The dinosaurs quickly learn that the conductor has night vision and his eyes "glow," a rather spooky sight. The group of dinosaurs uses their sense of smell, hearing, and vision to find various things during their nighttime scavenger hunt. The dark evening walk isn't too spooky until something unexpected (but not really all that scary) pops out along the way. I tend to bypass commercialized books because they often fail to measure up to my standards. While the writing in this one isn't stellar, I must admit The Spooky Scavenger Hunt does provide a nice springboard for talking about many scientific topics such as the senses and eyeshine or tapetum lucidum (the reason some animal's eyes glow/reflect light at night). According to scientists, Troodons most likely had nocturnal vision. Also, for those looking for spooky but not scary books without a Halloween slant, this one fits the bill. It doesn't specifically mention Halloween, candy, costumes or anything else associated with the holiday. Too bad the publishers didn't print actual glow-in-the dark eyes on the pages. While my kids generally liked the story, I think it would have been an even bigger spooky hit with glow-in-the dark Troodon eyes! 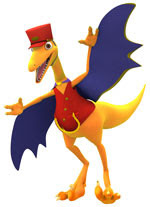 My son was a dinosaur for Halloween last year so I'm sure he'd love to dress up like one of the Dinosaur Train characters. If you're still looking for costume ideas this year, take a look at PBS Kids for directions on how to make your own Dinosaur Train Buddy costume or Sid the Science Kid Halloween Costume. Dinosaur Train themed costumes are also available for purchase from California Costume. Add a spooky, but not too scary read to your children's book collection! 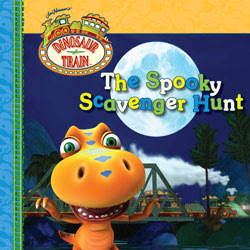 The Jim Henson Company has kindly offered to give away a copy of The Spooky Scavenger Hunt Dinosaur Train book. For a chance to win, leave a comment relative to this post or answer the following question: What's your favorite Halloween (or spooky) book or movie? • Contest ends on Monday, October 31st, 2011 at 11:59 PM CST. 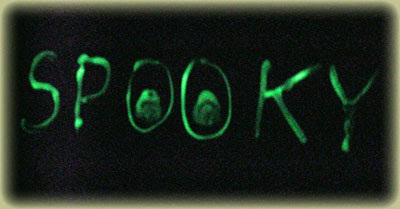 I have to get myself some of that glow-in-the-dark stuff :) Favorite Halloween movie? Hmm... It has to be Ghostbusters. I completely forgot about glow in the dark paint. Emily will love using it. She loves the glowsticks and glow in the dark stars. 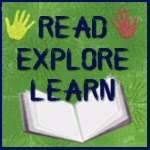 Thank you so much for sharing and linking up to stART! For an Entry: My favorite Halloween Movie would have to It's the Great Pumpkin, Charlie Brown! 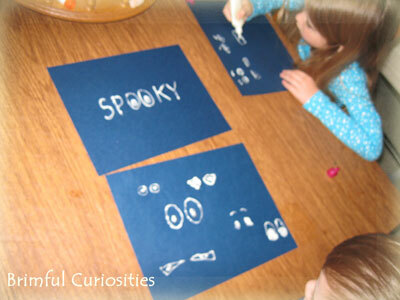 I hadn't thought about using glow in the dark paint for Halloween projects. Your project looks awesome. Favorite Halloween movie has to be It's the Great Pumpkin, Charlie Brown! It's a tradition to watch it. I used to watch it every year with my dad when I was little. Glow in the dark paint is awesome! I'm going to have to pick some of that up. Fun idea. I"m following you. Thanks for the chance to win. My kids love the Dinosaur Train episode that goes along with this book! They also love pumpkin books; the one they are reading at the moment is "Five Little Pumpkins", which is not very scary. 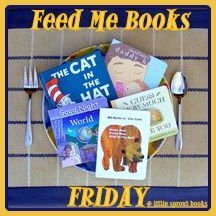 Thanks for linking at Feed Me Books Friday! My son is wary about spooky and not into scary AT ALL, so our selection is pretty tame. I think my favorite is And Then Comes Halloween, because it's more about the season than the tricks and treats. I love your glowing eye project and I'm really impressed by your photography - glowing subjects are hard! I'm impressed at how well the photos of your spooky eyes came out! I used to be scared to death of the Halloween movies and didn't watch them until I was an adult, but now I love watching them! Our favorite is Eve Bunting's Scary, Scary Halloweens great story with beautiful pictures. My favorite is It's The Great Pumpkin Charlie Brown. The Great Pumokin Charlie Brown is my all time favorite! My favorite Halloween book is "The Pumpkin Gospel" by Mary Minz Simon. The back cover description reads- "Carving a pumpkin can teach your entire family how God transforms us into beautiful creations to shine for Him." The front cover glows in the dark too! Thanks so much! Our favorite Halloween book is Frankie Stein. we just watched spooky buddies last night very cute.